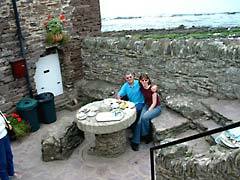 For our 2003 holiday we rented a cottage in south Devon and toured the area; this included a splendid steam train ride on the preserved South Devon Railway from Buckfastleigh to Totnes and a scenic walk along the South West Coast Path from lovely Wembury beach to Heybrook Bay. We also visited areas remembered by Mike from his childhood family holidays in the 20s, er sorry, 70s. 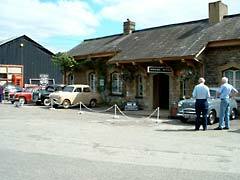 Here's the station at Buckfastleigh, where we caught the steam train on the South Devon Railway. There were some wonderful old cars outside the station building to add to the nostalgic sixties feel. 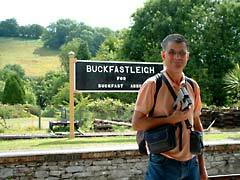 We waited on the pristine platform at Buckfastleigh, with cameras ready to roll, poised to capture the South Devon Railway steam train when it chuffed into this splendid station right on time. 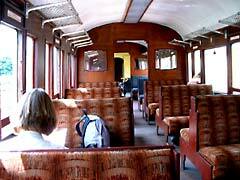 A look inside the vintage carriage showing the back of Belinda's head which is buried in the guide leaflet we picked up. Mike went to the buffet car - and returned with cold tea as he got waylaid chatting to some enthusiastic South Devon Railway steam buffs! The train stopped at signals quite frequently on its journey to Totnes, we found out from said steam buffs that a newly delivered diesel locomotive was coming up the other way and our steam train had to wait at a passing point on the single track line. 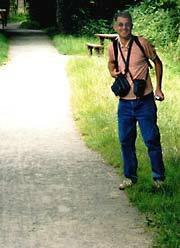 ...a short walk from the railway station along this path to Totnes. 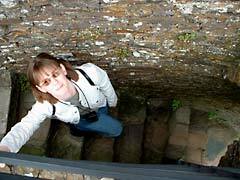 Spot the Devon tourist! Belinda just couldn't leave her mobile alone, even on holiday! We found a nice pub in Totnes for lunch as well as a large gift shop before moving on to visit Totnes Castle. 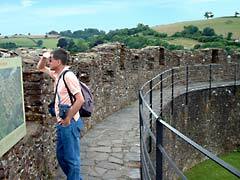 At Totnes Castle we looked out at the view over the town. The entrance cost the best part of a fiver and we have to say it wasn't the most exciting castle we've ever visited, poor value here then. 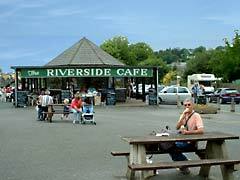 ...to the quayside at Totnes hoping to do a River Dart cruise but were too late. So instead we enjoyed a delicious ice cream. 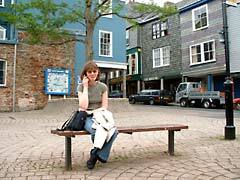 We thought Totnes a worthwhile visit, especially travelling there by steam train. The next day, and after a fruitless search for the now non-existent Kitley Caves, we went to Wembury and found this lovely little beach café to lunch in, located right on the beach. Delightful! 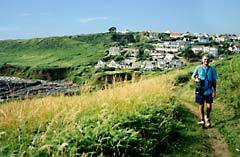 We walked along the South West Coast Path from Wembury to Heybrook Bay, stopping along the way to admire the view. 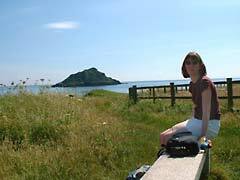 Here's a lovely view... of Burgh Island, and Belinda's not bad either! 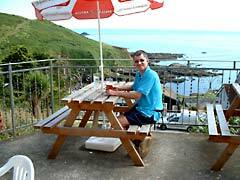 At Heybrook Bay we found the Eddystone Inn and stopped for a refreshing drink. Mike last visited here in '72 on a family holiday and was pleased to see little had changed, and this time he was allowed in the bar! 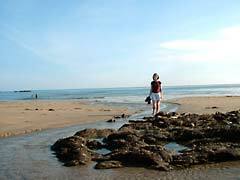 Right, back on the South West Coast Path then for the return walk to Wembury and after re-applying the sunscreen we re-traced our footsteps. Earlier in the day we found the farm that Mike stayed in two years running in the seventies, now disused. ... hot hot feet. 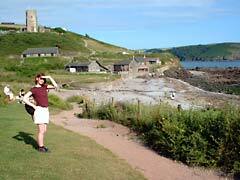 Wembury beach is marvellously unspoiled, with clean loos and that quaint beach café being the only facilities. Arrgghhh! 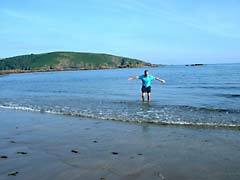 Mike went for a paddle too on Devon's Wembury beach and tried to fly! Seriously, the water was surprisingly warm and very refreshing, he's was just being a big wimp! 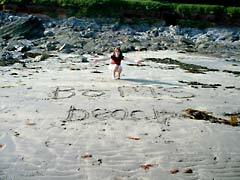 See our Devon holiday video clips too! 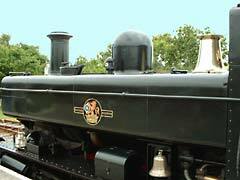 We've also holidayed in Cornwall, Dorset and Somerset and visited the GWR Cotswolds & Isle of Wight Steam Railway. And done more scenic coastal walking along the Pembrokeshire Coast Path.